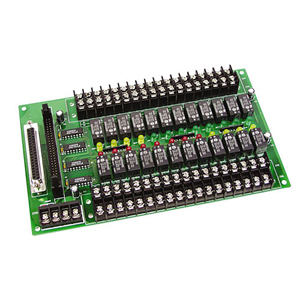 The OME-DB-24R consists of 24 form C, electromechanical relays for efficient switching of load by programmed control. The contact of each relay can control a 0.5 A /110 V load or 1 A/24 Vdc. The relay is energized by applying a 5 V signal to the appropriate relay channel on the 50-pin OPTO-22 compatible connector or 37-pin D-Sub connector. Twenty-four enunciator LED’s, one for each relay, light when their associated relay is activated. To avoid overloading your PC ’s power supply, this board needs a +12 Vdc or +24 Vdc external power supply.